Unity Theatre announces rescheduled opening and extends its Out Of Space season. 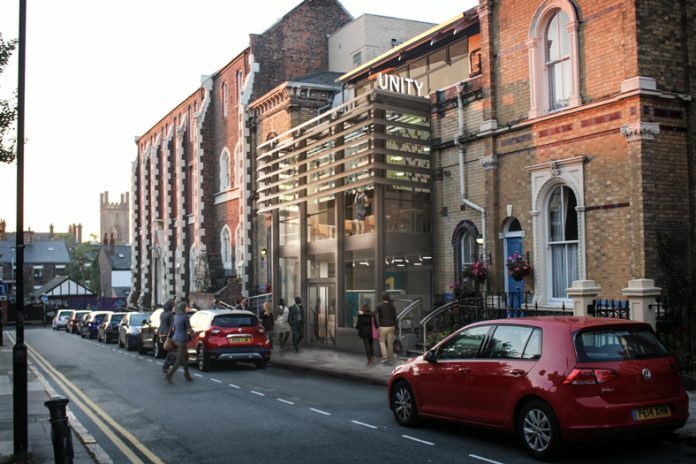 The team behind Unity Theatre’s Build Unity Better project has announced that the reopening date for the building, currently undergoing a £845,000 capital development project, has been rescheduled. Unity Theatre now aim to open with a short ‘soft launch’ summer season in June and July with the building officially opening in Autumn 2017. On Friday 19 May, Unity Theatre will still be participating in LightNight, Open Culture’s citywide festival, where festivalgoers passing through Hope Place will see window projections and a revised programme of street theatre outside the building. Aleasha Chaunte’s The Handless Project: Journey, 19 – 21 May, is still taking place, and the sleepover on 19th May, which was due to be held in Unity 2 has been relocated to Liverpool Cathedral, in atmospheric rooms in the oldest part of the building. The theatre maintains its long term commitment to Tmesis Theatre’s Physical Fest (26 May – 3 June) and will relocate the performance programme of the festival to The Arts Centre at City of Liverpool College and the Tmesis Theatre Training Company performances to Hope Street Theatre, 22 Hope St, Liverpool L1 9BY.